and that’s where I live! However, I have my two lovely fillies to keep me warm. (Yes!!!! Eat your heart out, guys!) I know they pick on me, but they keep me happy. But getting back to the cold, there are some things upon which I’d like to give my opinions from this special horse’s point of view. I’ve been around for some 14 years or so and have lived in different situations, so I have some background for my comments. I can’t stress enough that I wish more owners had more experience and knowledge about us equines when they decide to buy us or keep us at home or in a barn. 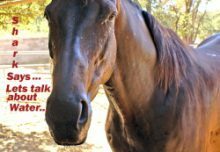 I’m sure that most of the “ignorant” things you do are not mal-intended, but merely from a lack of knowledge of how to treat us equines. I know Pam offers some private or group classes for people who are interested in learning about the proper way to care for us. I wish more people would take these classes from Pam or anyone else who could afford us more educated care. When I was talking about things this summer, I mentioned “cool, clear water” as a necessity. That was to have lots of water for the hot days and to be sure the tanks were cleaned regularly to get rid of any algae. Winter isn’t much different except that the water doesn’t get algae very quickly, but still needs to be cleaned regularly. when it came to our inners and digestion, etc. For those of you with automatic waterers, it’s really hard to tell if we’re drinking enough water. At least with buckets or water tanks in pastures or paddocks, people can see how much we’re drinking. It’s really important in the winter months. You may give us a bit of extra salt to help make us thirsty and you may add electrolytes to our feed. If you give us grain or supplements, you might make it into a mash with warm water to give us more intake of water. But, the bottom line is, please try to monitor and increase our water intake during the winter months. We aren’t very smart about it, which I hate to admit, but we need your help and observations. Please be alert for any signs of colic. If you don’t know what to look for ask your vet, or take a course or do some research on line. Winter can be ugly and hard on horses, whether in the barn or outside. We do a lot better if we carry some extra weight on our bones going into winter. Especially those of us who are getting up in years or are more frail. We use up a lot of energy trying to stay warm. Some of us will probably need some extra feedings, like a warm mash in the morning and afternoon. Pam has a few of the older guys here doing that. They go up to the barn for a supplemental mash in the morning and early afternoon. I must admit they look pretty good for their ages, being in their late twenties and thirty. 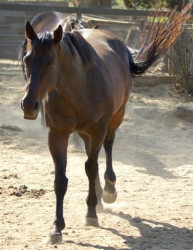 Be sure to keep up the worming during the winter months too. People are sometimes our worst enemies, even though you think you’re helping us. I think it makes you feel better to do certain things, thinking that it’s helping us, when it really isn’t. For instance, depending upon what part of the country you live in and have us, the barn may be a problem for our health. We’re really used to being outdoors in the natural environment. We have a knack for fending for ourselves. We know what it takes, for the most part. However, people want to coddle us and warm us up, etc. They close the barns, have heat, etc. The bottom line is we often end up getting sick due to a lack of ventilation and air circulation. Usually we horses will grow enough coat to keep ourselves warm under most circumstances, but when you blanket us and turn up the heat in the barn, you’re compromising us and exposing us to more germs. If we’re enclosed in a stall in a barn, leave the barn doors ajar for some ventilation and air circulation. If it’s an old barn there may be enough cracks between the boards for the air flow, but if it’s one of the newer prefab or newly constructed barns, they’re pretty airtight and need to have some way for the air to circulate without having the North Pole draft blowing through. If you use straw or shavings for bedding, the dust in the air from them can be bad for our respiratory system if there’s no ventilation to move it out. If we’re out in a paddock or pasture, we can manage quite well without a blanket if well attended and given sufficient feed and hay and some shelter from the elements. I believe that the blankets and coddling make our owners feel better, more than helping us. The thoughts are appreciated, but please don’t compromise our health to make you feel better about what you’re doing for us. Also, if we’re outside and get covered with mud from rolling, please clean the mud off. Our insulating hair can’t stand up to warm us if it’s coated in mud. Just give us a curry to clean off the mud. If you insist on putting a blanket on us, please make sure it’s the correct weight for the climate. Also, please be sure it’s waterproof, if you’re going to leave it on us outside in the rain or snow. There are any number of blankets manufactured that can fill your needs. Be sure it fits properly so we don’t get a leg hung up in it. If in doubt, check with your vet or local tack store. Lots of people want to body clip us in the winter. I know our winter coats aren’t very attractive, but they’re functional. A lot of people just don’t want to take the extra time grooming us or cooling us out after a ride when we sweat with our winter coats. How would you like to run around like a naked jaybird when it’s freezing outside? That’s what it feels like. For goodness sakes, if you’re going to body clip us, at least cover us up with a good blanket and please don’t leave us outside in the elements with no hair. In line with grooming us, be sure to take some extra precautions with your tack. It’s really easy to gall us and cause sores if the girth or saddle has dried mud on it that rubs and irritates our skin causing a sore. The same thing can happen with a dirty bridle rubbing on the face or a martingale yoke between the legs. Please take those extra few minutes to be sure our coats are clean and so is the tack. If you don’t, we very well may have to express our discomfort in a way you won’t appreciate, if you get my drift. Also before you stick that cold piece of steel or aluminum in my mouth, or any of my brethren, please warm it up in your hands for a few minutes. It really makes a world of difference. You can just blow on it in your hands and you warm breath will take the chill off it. 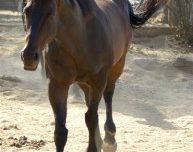 I guarantee it will put your horse in a better frame of mind and he or she will be more willing to accept the bit when you’re trying to bridle up. We really are pretty easy to get along with, if you take our thoughts, fears, misgivings and feelings into consideration. We’re not much different from you people in that sense. We prefer to please and live in harmony when we understand what you want, but we’ll also balk or fuss about things if we don’t understand or trust what you want or if we’re uncomfortable or hurt from something. Speaking of hurting, I live in sunny California, the land of the “California girls”, surfers, aging flower children, etc. It’s hot and dry in the summer, but wet and MUDDY in the winter, at least up north where we are. By about the end of February I’d rather have nice clean snow than the icky, sticky mud. It seems like foot abscesses are a way of life in the winter, which are no fun. They hurt big time. Please take care of us if we show signs of lameness. Depending upon your level of experience, you may be able to take care of us, but if in doubt, please call your vet to treat the problem. Foot abscesses are not only painful, but can become serious problems if they get infected. 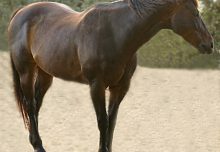 There are a couple of other problems common during the wet winters, such as “mud fever”, which is from standing around in the mud, “rain rot”, which forms scabs on the horses’ coats from being out in the rain. These should be recognized and treated. If you don’t have the experience, please contact your vet to take care of us. We also develop the snotty noses and coughs just like people, especially if there is a lot of traffic of horses coming and going from different places. We really don’t have to worry about that here at the farm, but when Pam gets a new horse in she’ll “quarantine” him/her for several days, just in case they brought anything with them that could be transmitted to the rest of us.